I’d heard a lot of positive things about the Cambodian islands, so I was happy to finally be visiting there! I met back up with Amanda and Dylan to head to Koh Rong first. After some hecticness with the speed boat (the morning boats had been cancelled 2 days in a row so everyone was trying to get the 3pm one) I managed to get on the same boat as Amanda and Dylan, last person to board too! We headed to Koh Rong main beach first, where we met up with James who’d we’d met in Battambang and a guy named Tony who the other 3 had already met in Sihanoukville. The main beach is not great, it has a pretty rank smell and is full of wannabe stoner backpackers. We whiled away the evening playing cards at Bongs, which is a decent bar/hostel/restaurant. Me, Amanda and Dylan had a room in a place just behind. Bongs had 5 kittens, which naturally received a great deal of our attention. 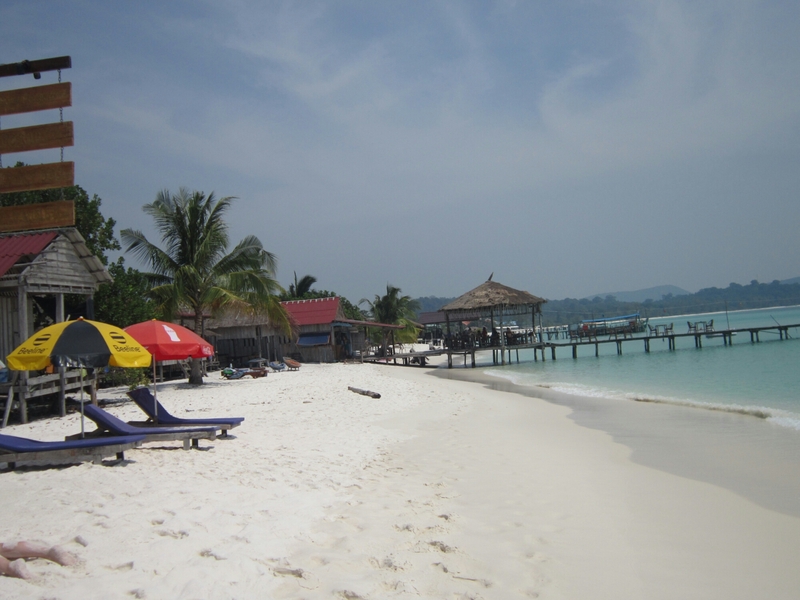 So next day, we head by Taxi Boat to Koh Rong Sok San beach. This day was my 100th of this trip, a nice milestone to reach. 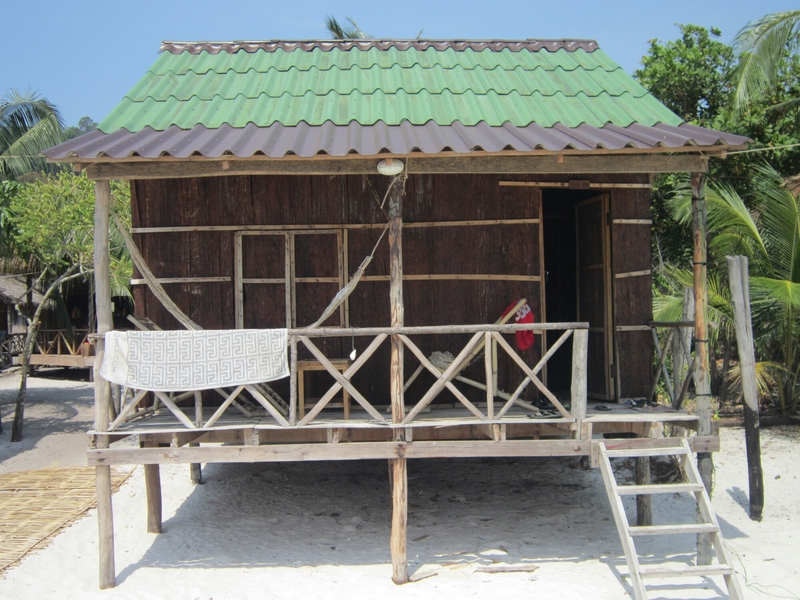 We found ourselves a bungalow on the beach for $45 a night, not too bad split between 5 of us. That day and the next were spent just relaxing on the beach, getting plenty of reading done and listening to a lot of music. There’s no party on this beach (at least not when we were there) and the sand and water are idyllic. 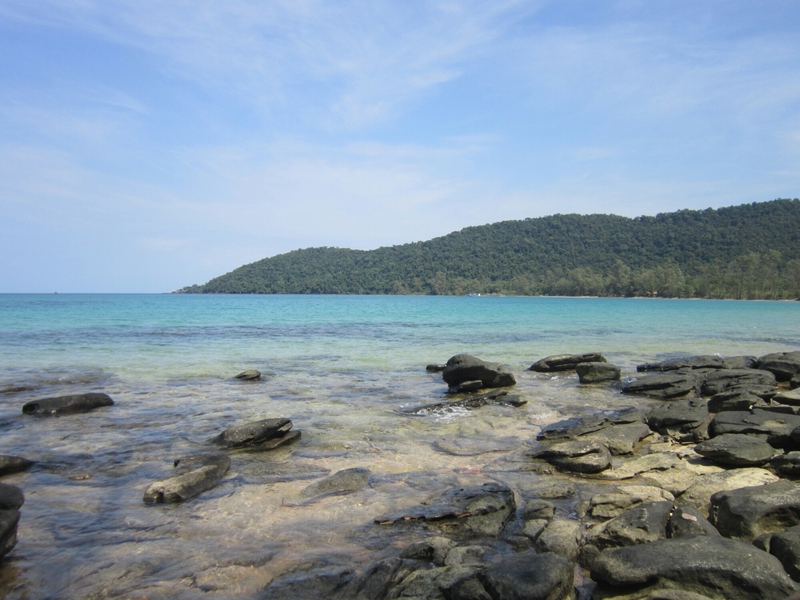 Next up, M’Pai Bay on Koh Rong Sanloem. We taxi boated it there, $50 for the 5 of us, taking a couple of hours. 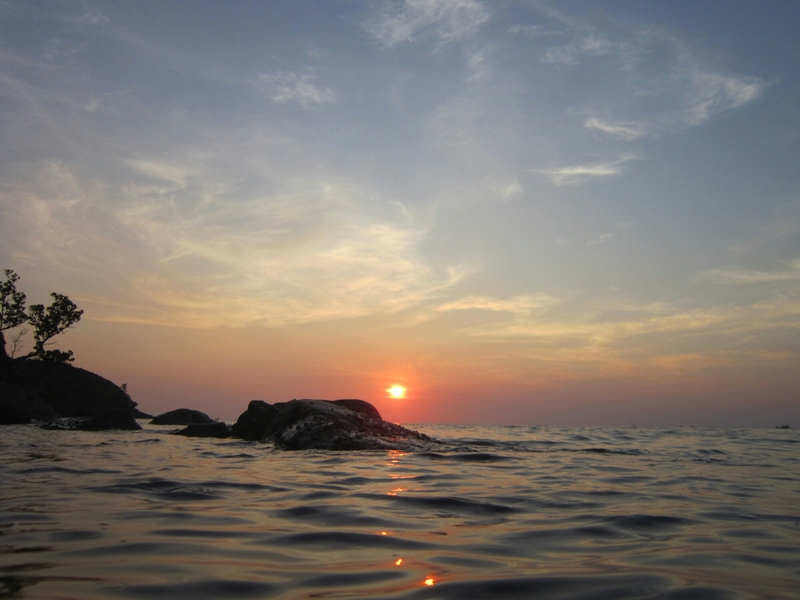 It consists of a small village and a beach which stretch’s along for a decent length. Unfortunately there had been a storm a few days ago which had blown away half the beach and washed a lot of rubbish a shore. We stayed for 4 days in total. Annoyingly I got a bit sick whist there, so was a bit of a zombie for the 2 middle days, though felt much better on the last. There’s always stories flying around of food poisoning on these islands and i’m sure that’s what I fell victim too, one of the others was feeling bad too. That put me in a bit of a bad mood as the thing to do there is chill, which is kinda hard when you feel nauseous. But when I was healthy it was a pretty fun place! We stayed at Chill Inn Hostel, which is the last place open at night as it has solar panels whereas everywhere else shuts when the power cuts at midnight. It’s a cool place, the owner is a top guy and he plays some good tunes. Another cool place is Easy Tiger. I met back up with Beckie ( http://www.jetsetterjones.com ) on my last full day on the island, she has known the owner (Neil) of Easy Tiger for a long time so it was good to catch up with her and meet him and Nick works there too. Neil is also from Bristol so we had a nice little West Country collective going on. Also thanks to Big Moon who 2 days running put the football on the TV so me and James could watch some whilst munching our dinner. Also mention for Sunset as it is a good place for food. So my time (when not sick), when not in aforementioned places was mostly spent on the rocks along from the village by the main beach stretch, reading and listening to music. Walked along the beach a bit too, it’s nice. I also found a great spot for sunset by scrambling along the rocks on the North West of the island, finding a nice rock formation branching out where I could sit with a head on view as the sun went down. There was tonnes of crabs on the rocks too! Enjoyed sitting there with music watching the sun fade for a couple of nights in a row. 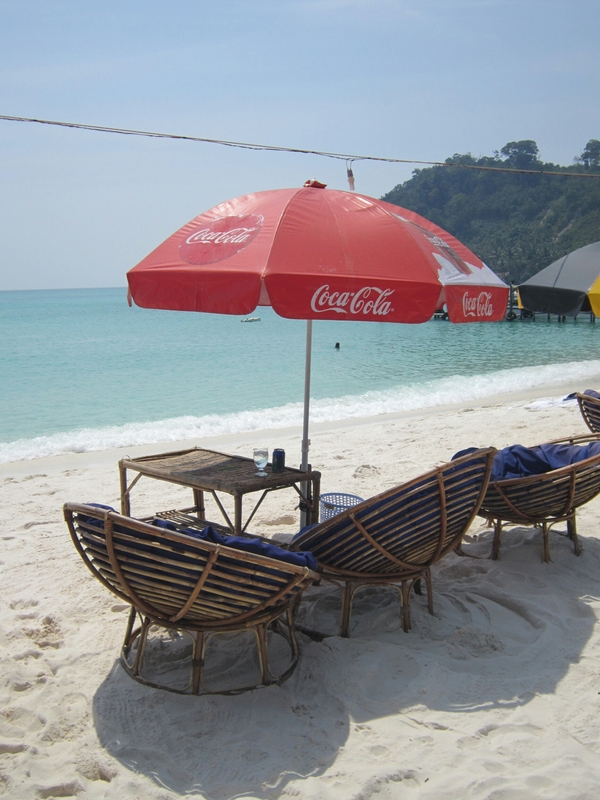 Hey Dave, when I was on koh rong samloem, there was also a big storm, the day when I arrived. So the beautiful beach was gone. Funny, that the same thing happened to both of us. And I know beckie Jones as well, I got to know her on a trekking trip in Cambodia – small world! !